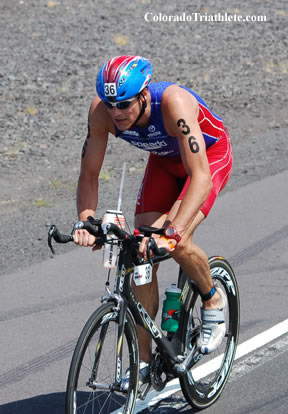 October 11, 2008 (Kailua-Kona, Hawaii) – This year’s Ironman World Championship returned to more typical Kona conditions as the lava fields radiated immense heat in the sun and the winds buffeted the racers along the Kohala Coast. Also mimicking familiar scenarios from the past, many over-confidant pro athletes went much faster than their bodies could actually handle, only to leave them weakened when they reached the marathon. Past winners were reduced to walking or even quitting as their competitors passed them by. 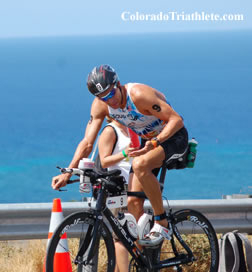 Andy Potts of Colorado Springs raced the full Ironman distance for the first time in his life, and he certainly had a stellar debut. The Olympic-distance star came out of the water ahead of the next group by almost three minutes. He then proceeded to ride the 112 miles in 4:46 and run the marathon in 2:54:31. 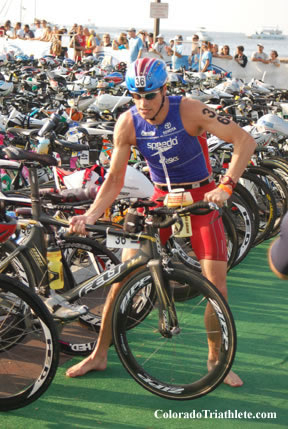 He decided he should take a trip over to the med tent but added, “I didn’t even stop to give high fives because I was getting so much pressure from Mathias Hecht from behind.” The Swiss triathlete crossed the line only twelve seconds later. Close on Hecht’s heels was Boulder’s Michael Lovato, finishing just 45 seconds later. Lovato fell far behind the lead group on the bike, suffering from a massive case of dehydration—a constant danger in this race. Lovato knows this for a fact, too, since he has undergone extensive testing at the Gatorade lab. Potts crossed the line in eighth and Lovato tenth, but a silly mistake by German Timo Bracht pushed them into seventh and ninth. Bracht failed to serve a penalty at the second transition and was disqualified after the race. Bracht’s disqualification gave Lovato his third ninth place finish in six years (2003, 2007, 2008). Australia’s Craig Alexander dominated the impressive men’s field consisting of Ironman World Champions such as Chris McCormack, Normann Stadler, Faris Al-Sultan and other top contenders including Chris Lieto, Eneko Llanos, Torbjorn Sindballe, Cameron Brown and Rutger Beke. 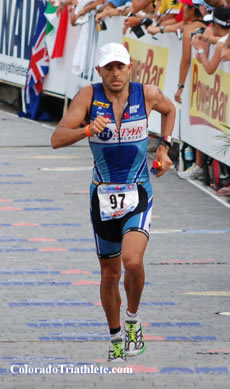 Alexander, with an Ironman 70.3 World Championship title in addition to a second-place finish last year in Kona, crossed the line with a time of 8:17:45. 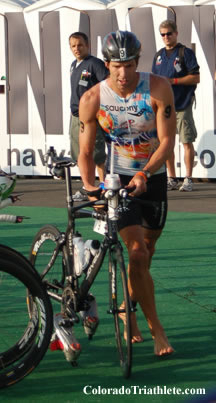 In the women’s race, Chrissie Wellington defended her title in a time of 9:06:23 despite spending ten minutes to fix a flat tire. She overcame her troubles with a strong run, eclipsing the women’s run course record with a blistering marathon time of 2:57:44. Third-place female, Sandra Wollenhorst, also went under the old record with a time of 2:58:35. Closer to home, Wendy Mader of Fort Collins turned in a performance worthy of a pro athlete. She finished 16th overall in the women’s field and took honors as the top female amateur with her finish time of 9:53:51. The performance placed her among the top third of the pro women. 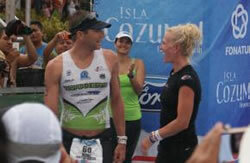 An accomplished triathlete, Mader won her age group at the 2005 ITU Olympic distance world championships. 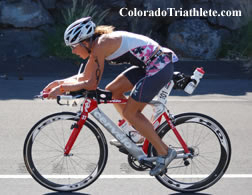 Locally, she claimed the series title for the Boulder Triathlon Series in 2006 and has twice taken the overall win at the Loveland Lake to Lake Triathlon. Littleton’s Kelly Lear-Kaul was second in the 35-39 age group behind Mader, and 32nd woman overall. 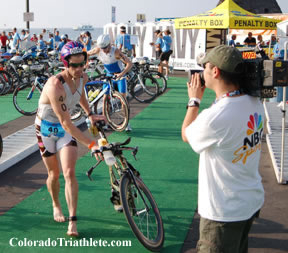 Will Ronco, a pro from Boulder, finished 38th overall in 9:05:35. 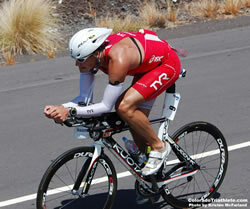 Jeff Keil of Louisville, racing in the 35-39 group, came in 21-seconds later in 40th place. Perennially strong Tim Hola of Highlands Ranch moved up thirty-nine places from last year’s race to finish 42nd overall in the men’s field and fourth in the 30-34 age group. He clocked a time of 9:08:38. 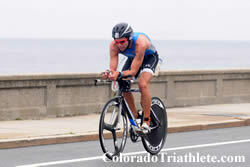 Two more Colorado pro-division racers, Brad Seng (9:12:02) and Justin Hurd (9:12:54), were 48th and 50th. 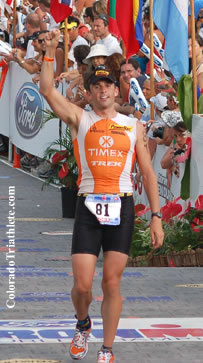 Ed McDevitt set a Kona personal best with his time of 9:33:52; and Brandon Del Campo finished just behind him in 9:34:29. Michael Hagen, David Steigerwald, Jesse Vondracek, and Kevin Koch all came in under 10 hours. Including Wendy Mader, fourteen Coloradoans finished under ten hours, second only to California. 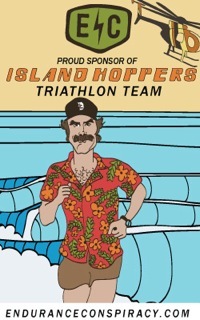 This year’s race marks the 30th anniversary of the Ironman triathlon. More than 70,000 athletes vie each year for slots to the championship event. 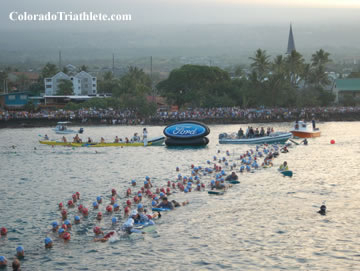 The race saw 1,731 athletes officially start the 2.4-mile swim, 112-mile bike and 26.2-mile run on the Big Island of Hawaii. Athletes finished their 140.6-mile journey to the cheers of more than 20,000 spectators on Alii Drive. 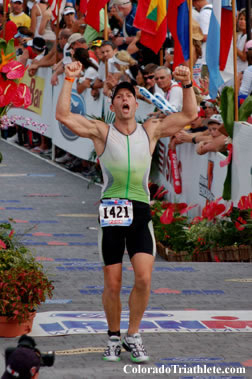 NBC will air the 2008 Ford Ironman World Championship on December 13, from 2:30 p.m. to 4:00 p.m. EST. This year’s NBC broadcast will feature a “special interest” athlete from Boulder. Sean Swarner, 34, overcame both Hodgkin’s Lymphoma and Askin’s Sarcoma as a teenager, losing a lung in the process. He has since climbed the highest mountains on all seven continents, including Mt. Everest. He is active in the Cancer Climber Association, a motivational cancer-survivor group. He completed the race in 11:44:15, despite having one lung.